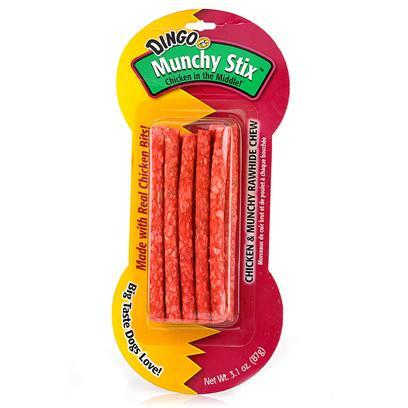 Home Categories Vitamins & Supplements Dingo - Chicken in the Middle Munchy Stix - 5"
Easy Chewing for Delicate Mouths...And Everyone Else, Too! These high protein treats, made from a combination of granulated rawhide and real chicken jerky, are easy on tender mouths. They're perfect for young developing puppy teeth, and old failing senior teeth. While they're great for light chewers, few heavy duty chewers will turn their noses up at Munchy Stix. Many dog parents with dogs of different sizes and ages find Munchy Stix are the perfect treat for everyone to enjoy together. One fan of Munchy Stix loves the price as much as her dogs love the taste: We have three dogs...and all of them go crazy for these sticks!! They are a great price (pack of 10 under 2 dollars!) and when they see the package they go crazy...I would recommend to any dog family! Each Munchy Stick is about 5 long, and the Stix come in a pack of 10 or, for super savings, a pack of 50.